Thank you to the NJ Council on Developmental Disabilities for sponsoring a van trip to Washington DC on September 25th to participate in the hearing opposing the Graham-Cassidy health care bill. During the trip, the group discussed the implications of the bill and how it could effect the disabled and elderly. 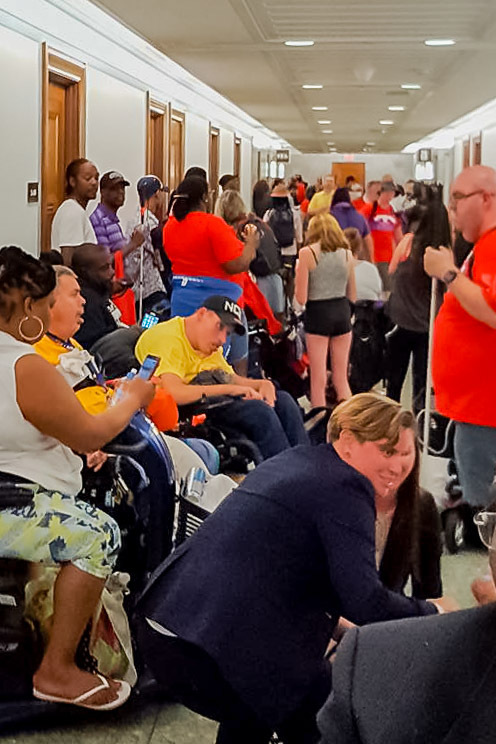 We made signs in the van, and once in Washington went inside the Dirksen Senate Office Building and joined ADAPT and other disability organizations in chanting "No cuts to Medicaid! Save our liberty!" We had the opportunity to speak with other advocates from around the country and catch up with some old friends. The hearing room, hallway and overflow room were packed with people and media from all over. It was an incredible effort by all. When the hearing ended, we visited Senator Booker's office to express our gratitude for his support of Medicaid. The Senator was not available, but we were able to talk with his staff and write thank you's in his sign in book. On our way home from Washington, we received word that Senator Collins was voting no! The advocacy in Washington and those who submitted testimony, called their Senators and participated in rallies and events is having an effect. Please keep calling and using social media. The advocacy and fight is not over yet! Posted on September 25, 2017 by Brian Mazzarella and filed under Advocacy.